So goes the famous 40-year-old advertising slogan of name-brand pantyhose maker L’eggs, a slogan still used today because it conveys a timeless truth: Shapely stems get noticed. Trouble is, it takes more than decent nylons to produce fabulous-looking legs. Good genes are the most helpful. Stiletto heels, jogging, old-fashioned iron-pumping, they all help, too. But what if you were short shrifted in the gene department and can’t seem to develop that attractive calf silhouette no matter how many leg-lifts you do or pairs of Jimmy Choos you own? The fix for you might be calf implants. Long a popular procedure among women, calf implants are fast becoming a cosmetic surgery choice among image-conscious men. According to Jim’s doctor, Nikolas V. Chugay, DO, of Chugay Cosmetic Surgery Medical Clinic Inc. in Beverly Hills, Calif., about 60 percent of his patients who have calf implants are women. The majority of them undergo this procedure because they desire anatomically balanced legs. Heels don’t always create the curves where you want them most. But, that’s not to say that their male counterparts don’t also long for shapely legs. Cosmetic surgeon Chasby Sacks, MD, of Arizona Cosmetic Surgery in Phoenix, says that about 70 percent of his patients are men. The source of those stubbornly stick-like stems? Another reason to blame your parents. But, how do calf implants overcome those inadequate genes and not look artificial? 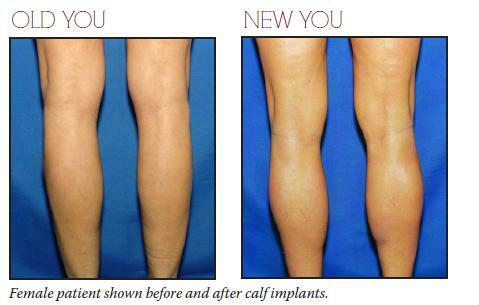 “Calf implants mimic the natural shape of the calf muscle. They’re made of solid, very soft and pliable material that’s silicone-based,” Dr. Chugay explains. The anatomically correct devices—two per leg—come in a variety of dimensions to achieve different effects. “Overall, they are designed to add volume to your underdeveloped legs and structurally give appropriate shape,” he says. A single calf implant on each side can be placed to fill in a deficient inner calf muscle without augmenting the outside of the lower leg. But in many cases, both sides of each leg are implanted during a single surgery session. Sometimes, the preferred way to go is by placing an implant on one side of each calf, then, six months later, placing the second on the opposite sides. In cases where one leg is normal in size and shape, implants may be necessary for only the thinner of the two, Dr. Chugay explains. Be aware that this procedure carries with it a slight risk of minor nerve damage that can cause numbness in the foot. Calf implants are ordinarily an outpatient procedure, with the work completed in about 30 minutes to 45 minutes per leg. Fat transfers are often performed on the ankles to improve symmetry where calves and feet meet. For surgery, Dr. Chugay’s calf implant patients are usually under intravenous twilight-sleep anesthesia. “I also put local anesthetic into the area of the calf so that nothing is felt during the operation or immediately after,” he adds. The surgical technique for placing the calf implant is similar to that performed in breast augmentations. The surgery involves making a small incision in the back of the knee, directly in the fleshy fold, and, then creating a pocket between the lining of the calf muscle and the muscle itself. Dr. Chugay says he performs the surgery in such a way that helps to minimize bleeding and reduce the risk of injury to tendons, nerves, blood vessels and other tissues. Patients are then sent home the same day with a week’s supply of pain medication. During the recovery period, you can expect to rely on crutches for at least a few days and to wear a compression stocking over each leg for at least two weeks. You will have to curtail your physical activity for a full month, but light exercise should be possible in about two weeks post-surgery. Jim says his own recuperation lasted six weeks, at the end of which he excitedly packed his swim trunks and hopped a flight to Hawaii to celebrate. Today, a year later, Jim is just as thrilled with his implants. Not only does he have those curves in his calves, but the implants don’t interfere with exercise and other vigorous activities, such as running.